Stop by these holiday light displays around the area! The Alexandria Holiday Boat Parade of Lights swings by Washington Harbour in Georgetown (3000 block of K Street NW) for a repeat performance. See the Virginia section below for more info. Dec. 4; 6 p.m.; free. Speaker of the House John Boehner will illuminate the Capitol Christmas Tree, hosted on the West Lawn of the Capitol building (Constitution and Independence avenues NW). The U.S. Navy Band's Ceremonial Brass will perform. After the lighting ceremony, the tree will be lit up nightly with eco-friendly LED lights. Ceremony Dec. 6; 5 p.m.; free. Hours for tree viewing: dusk-11 p.m. through Jan. 1. 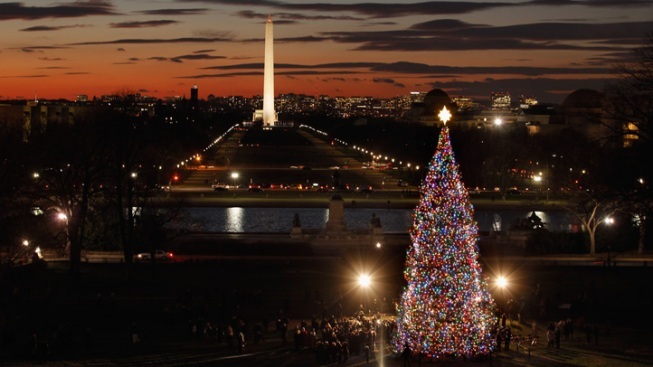 Even if you didn't get tickets in the online lottery for the lighting ceremony of the National Christmas Tree (1600 Pennsylvania Ave. NW), you can still view the gorgeous tree every night through New Year's. Besides the tree, you can check out a Yule log display, model train, Christmas manger scene and live music performances on the Ellipse stage. Santa will also be paying a visit to the tree and setting up a workshop -- stop by during these hours to get a chance to visit. Weeknight performances 6-8:30 p.m.; weekend performances 4-8:30 p.m.; free. Start Hanukkah off right with the National Menorah Lighting at the White House (1600 Pennsylvania Ave. NW). The President's Own U.S. Marine Band will perform, and hot latkes and donuts will be served. Make sure to reserve tickets. Dec. 20; 4 p.m.; free but tickets required. During Zoo Lights, the paths of the National Zoo are decked out in lights, and exhibit buildings stay open late for a holiday safari. The Mane Restaurant will be open for dinner with holiday goodies like hot cocoa, roasted nuts, kettle corn, gingerbread, mulled cider, peppermint schnapps and spirits. This year, coordinators are debuting an "iceless" skating rink made of eco-friendly and recyclable faux ice. Kids can get a picture with Panda Claws, take a ride on the Kid's Farm Train, and see the winning entries to the Gin-Grr-bread Farm contest. Free admission; parking $16; eco-skate is $5 for 30 minutes; skate rentals are $2. Fridays and Saturdays from Nov. 25-Dec. 11 and nightly Dec. 16-Jan. 1, open through 9 p.m. Closed Dec. 24-25. Drive through a sparkling, musical exhibit at Shadrack's Christmas Show at Adventure Park USA (11113 West Baldwin Rd. New Market, Md.). Enjoy hot cocoa, s’mores and Christmas cookies, and kids can snap a pic with Santa himself. Buy a ticket to the show, and all of the park’s indoor attractions, like laser tag and teacup rides, will be discounted. Nov. 18.-Jan. 8, dusk-10 p.m. nightly; $25 per car. Light show, more than a dozen decorated Christmas trees, a nativity scene and live musical performances will be a part of this year's Festival of Lights at the DC Mormon Temple (9900 Stoneybrook Drive, Kensington, Md.). Some musical acts include the Bells at Mount Vernon Handbell Choir (Dec. 9), the Mormon Choir of Washington (Dec. 10) and the Free State Saxophone Quartet (Dec. 22). Dec. 3-Jan. 1; free. Dusk to 10 p.m. every night; nativity open 6-9 p.m.' music 7-8 p.m.
Get Christmas cheer at the beach with Lights on the Bay at Sandy Point State Park (1100 East College Parkway, Annapolis, Md.). See all your favorite holiday characters from Santa to Frosty taking it easy on the Chesapeake Bay. Nov. 19-Jan. 1, 5-10 p.m. nightly; $14 per car. Look for weeknight discount coupons in The Baltimore Sun, The Capital newspaper, Anne Arundel County libraries and other local businesses. Can’t find any holiday sparkle in your neighborhood? Drive to the Winter Lights Fetsival at Seneca Creek State Park (11950 Clopper Road, Gaithersburg, Md.) to see 300+ displays with various themes like Winter Woods, Victorian Village and the North Pole. Proceeds will benefit local area charities. Nov. 25-26, Dec. 2-31 nightly (except Mondays and Dec. 25); $12. Weekdays 6-9 p.m. Weekends 6-10 p.m.; $15. Don't miss the Winter Festival of Lights at Watkins Regional Park (301 Watkins Park Drive, Upper Marlboro, Md.). The spectacular drive-though includes more than a million twinkling lights and fun displays, including Santa flying a helicopter and driving a fire truck. Through Jan. 1; free on Christmas Day. Admission $5 per car or van. NBC4's Eun Yang flips the switch at Rockville Town Square (200 E. Middle Lane, Rockville, Md.) to illuminate their tree. Go for horse-drawn carriage rides (available with the donation of a new toy or gift card to benefit the Montgomery County Housing Opportunities Commission), catch performances by the Walter Johnson High School choir, Dawn Crafton Dance Studio and Rockville Musical Theater Center, and photo ops with Santa. Dec. 14, 6:30-9:30 p.m.
Santa arrives by boat for the Alexandria Holiday Boat Parade of Lights at the Alexandria waterfront (Union Street, between King and Cameron, Alexandria). Boats along the harbor will compete for decoration prizes. Catch a holiday show at the nearby Torpedo Factory Art Center (105 N. Union St.). Dec. 3 in Alexandria; 4-7 p.m.; free. Dec. 4, repeat parade at Washington Harbour in Georgetown (3000 block of K Street NW), 6 p.m.
At Bull Run Regional Park (7700 Bull Run Drive, Centreville, Va.), check out some light displays and get in the holiday spirit with a winter carnival. The Bull Run Festival of Lights features penguins, elves and the big man himself, as well as Santa's Enchanted Lights -- a show set to holiday music classics like music from "The Nutcracker. The festival at the Winter Wonderland Holiday Village offers ice skating, shopping and even rides. Light show, Nov. 23-Jan. 8. Carnival, Nov. 25-27, Dec. 1-4, 8-11, 15-31 and Jan. 1. 5:30-9:30 p.m. weeknights; 5:30-10 p.m. weekends and holidays. For a homey local holiday event, be sure to check out the Leesburg Tree Lighting at the Leesburg Town Green (25 W. Market St., Leesburg, Va.). Local schools will be performing, and the mayor will give a holiday speech. Need added incentive to head all the way to Leesburg? Stores will be open late to kick off your Christmas shopping. Dec. 2; 6 p.m.; free. Get a glimpse into a colonial Christmas with the Mount Vernon by Candlelight. Guided by Martha Washington, guests will get a chance to see the Mount Vernon Estate (3200 Mount Vernon Memorial Highway, Mount Vernon, Va.) decked out in its holiday finery, while enjoying caroling and hot cider. Nov. 25-27; Dec. 3-4, 10-11, 17-18, 5-8 p.m.; $20 adults; $14 kids. Reservations suggested. The Village at Shirlington holds Shirlie Lights Up the Village, featuring a Christmas tree lighting, holiday carolers, carriage rides, and photos with Santa on Dec. 1. Bring non-perishable food items to donate to the Arlington Food Assistance Center. Dec. 1, 6:30-8:30 p.m. Shirlie's 10 Days of Giving follows (Dec. 14-23), with chances to win gifts and goodies from local shops. Enter online here.